Sure, You’re a VIP...But is it Better to Give or to Receive? Want to score major brownie points? We’ll show you how to redeem your hotel rewards points for a friend or family member! 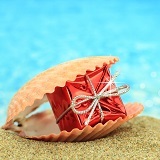 Gifting luxurious hotel stays to others can bring a lot of joy to the giver and to the receiver. So which of the major hotel groups allow you to do this? Hilton makes booking awards for others easy. Hilton’s terms and conditions clearly state award nights may be issued to the HHonors member, or to any other person, as directed by the HHonors member. You will need to call Hilton HHonors at 800-548-8690 to make the reservation because you can't add a name other than your own online. But, it’s quick and easy. Hyatt makes booking awards for others very easy AND even allows Diamond Elite members to extend their Diamond benefits to their lucky Guest of Honor! Simply log in to your account and during the reservation process add your guest’s information as the primary guest. If you are a Diamond member and would like to book a Guest of Honor award stay, you'll need to call 800-400-2261 in the US or Canada or your nearest global contact center to gift a free stay until December 30, 2015! Booking award stays for others with IHG is a bit more challenging. Although we’ve heard many have been successful booking award stays for others using their IHG Rewards Club points. While IHG's terms and conditions are silent on restricting the ability to book award nights for others, the only way to do this is to make an online reservation in your own name or by phone at 877-865-6578 and then add the person you intend to gift your award night to as a room guest. While the person listed as a guest should be able to check-in easily, we suggest you leave a note in the reservation or call IHG and mention that your guest will be the one checking in. The big positive in this strategy is the guest will likely enjoy your elite status benefits since the hotel room is in your name. But, it may also be problematic if the guest has a challenge checking in and you are not staying at the same hotel or nearby to lend a hand. Marriott makes booking awards for others easy. Marriott Rewards allow you to book award nights for others but you need to call Marriott Rewards at 801-468-4000 to make the reservation because you can't add a name other than your own online. It should be quick and easy. Starwood makes booking awards for others easy. SPG’s terms and conditions state that SPG Awards are typically non-transferable, but certain SPG Awards may be given to a third party where an SPG Member makes the request at the time the SPG Award is issued. You may book an award night in someone else’s name using your own SPG Starpoints, but you have to call SPG to make the reservation 888-625-4988 because you can't add a name other than your own online. It should be quick and easy. Oh, and watch out for this one! Certain bonus offers and award night certificates, including those earned through a hotel credit card, contain terms and conditions that expressly state they are not transferable. So anytime you redeem a certificate or night earned as a result of a bonus instead of rewards points, we suggest you review the terms and conditions carefully if you intend to gift the stay to someone else. Ok, let’s wrap this one up! Booking award nights for others is the most challenging with IHG. But Hilton, Hyatt, Marriott and Starwood make the process quite simple. We suggest you call the hotel to confirm all the details to ensure a smooth arrival and departure for your guest. So is it better to give than it is to receive? Who knows. But we do know that travel is the gift that keeps on giving. So go on - give a little to someone special today!